The RGB color model is when (R)ed, (G)reen, and (B)lue light are added together in various ways to reproduce a broad array of colors. When mixing red (100%) + green (100%) + blue (100%), white light is created. Not only can we control the color, we can control the brightness, we can also change colors slowly or fast. With a remote control, we can turn the lights on and off, or control any of the other functions. Change the color to suit your mood. In home theater rooms, change the color to suit the movie / music. An RGB 'chip' is actually made up of 3 separate LED chips, one red, one, green, one blue. The strip can be cut shorter, there are markings on the strip that tell you where it is safe to cut. The basic RGB setup requires a 5m roll of RGB strip, and a RGB controller. The controller tells the strips how much of each color is required. A strip is useless without a controller. There are many types, some have added functions and can run more strip. An RGB controller will allow you to pick a color, dim, strobe, fade, on/off, all by remote. 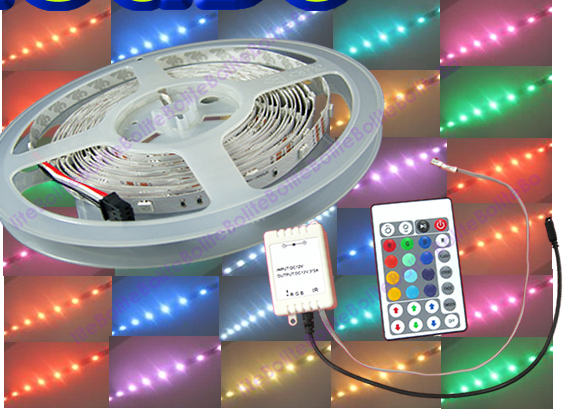 As with other LEDs, RGB is a 12v setup. A transformer is usually required. For a 5m strip, a 5A supply is best. For a 10m length, a 10A supply. For 8m, a 5A will not be enough, so a 10A is required. For 20m, 2 x 10A supply is needed. An amplifier takes the small current output from the controller, and amplifies it so that it can run a longer length. Our strips come with a full silicon case, providing better waterproofing and easier installation. What will I need for installing 10 meters of RGB Led Strip in a line, in my kitchen? You can run more than 10m of strip, but not in a line. To get a 20m line for example, you would need a 2nd amplifier at the 10m mark. What controller types are there? Do I need one? 2. 44 key: much more functions. 20 standard colors plus 6 custom colors can be stored. Contol brightness, speed, pattern (individual buttons). Increase red / green / blue components individually. 3 extra patterns. Play / pause feature. 4. RF controller. Controls by radio rather than infra-red, no need to have a wire exposed to make line of sight. No need to point remote at the receiver. High current rating to run more strip. Waterproof wall control as well as remote. 5. Color wheel controller. Also RF and also high current. More colors and patterns, touch control remote. Very ipad. Our top seller. 6. Wifi controller. Use your iPhone / Android phone / tablet to control using the app. Or you can use the RF remote.